Clean fairly comfortable bunk beds in a good part of town near the beach. Hotel staff was helpful with my early morning departures and provided everything I needed. Great hostel I ended up coming back and staying again. Staff are awesome, beds are comfy, facilities are well worth the money and good vibes each night. Great location and staff here were amazing and had a great time. Didn't want to leave! We were greeted by very friendly members of staff. Nothing was too much trouble for them. The private room was clean and comfortable, and even had AC and nice hot shower too! The Wifi was good, free breakfast and coffee in the morning. Highly recommended! We had a great stay at this place. Perfect location close to everything, modern facilities & plenty of space very green with lot of plants. The private room bed was very comfortable & the room had air conditioning, lots of power points. The staff were fantastic and friendly. The girls at the breakfast desk were lovely each day and receptionist was very helpful he carried all my heavy bags, offered advice and recommendations. Exceptional customer service. Recommend! I stayed at this hostel straight from the airport after 18 hours travel and was great for a starter hostel to meet people and settle in. Pick up from the airport worked out well, area is very safe, facilities are clean, they give you a map of the area at check in and all the information you need. Salsa and bbq at the rooftop was fun. I really liked Alpes! Great location in Miraflores, close to the beach, Larcomar, etc. but also in a quiet residential area. Hostel had a great rooftop terrace with a bar and free breakfast, which was lovely. Dorms were decent with lockers and an ensuite. Beds were great, the bunks were quite sturdy, not a lot of shaking. Air con in the rooms from 9pm to 10am, but it has to be turned on by staff, one night it wasn’t turned on til 2am. Beside that, was a great stay! Will be back! 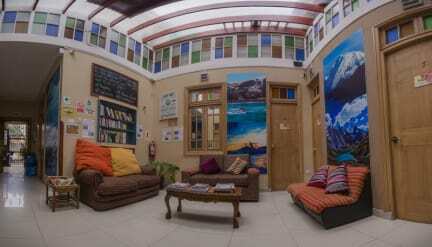 The hostel is in a good location for the beach - it is about a 10 minute walk from the other hostels and bars in miraflores. The staff were helpful and friendly and the dorm rooms were fine. I would stay here again.